Check out our blog for weekly moving tips and advice from the leading Dallas moving company, Garrett’s Moving and Storage! There are a ton of options when it comes to moving. An individual can choose to rent a truck and move all of their belongings on their own, they can sell everything they own and buy new furniture when they get there, or they can hire a professional moving company. While hiring a mover may seem like a more expensive way to go, for most families it is the best option. Moving is one of the most stressful activities, especially when it is a long distance, and by working with a company that will pack and move your things there is a lot less pressure overall. Less stress is a major benefit to hiring a professional mover. A moving company will come into your home, pack up your belongings with care, and fill up their truck with all of your things. They transport all of your items to your new home, and when they get there you can unpack knowing everything is there. Because you didn’t have to pack everything yourself, and worry about moving, your stress levels will be much lower, and you will be able to enjoy your new area faster. Settling in is much easier with movers. Professional movers know how to pack your items so that there will be no damage, they use professional packing materials, make sure everything is safe for the trip. It is very simple for the consumer because the movers show up one day, get it all done, and then the consumer is able to relax in their new home. Another benefit of hiring a professional moving company is that most of them can expedite delivery. Of course, this is within reason, but within a week or two all of your personal belongings can be joining you in your new home. When you do talk to a moving company, ask about the pick-up and delivery times; this allows you to plan the rest of your move. 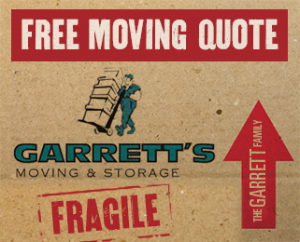 Garrett’s Moving and Storage is a Dallas moving company with over 20 years of experience of moving in Dallas and across the country. We are BBB accredited so you can have peace of mind knowing your belongings will be in good hands. We also have a best-in-the-industry extended coverage policy. Contact us today at 972-487-5843 for a free estimate or click here to request a quote online from the leading Dallas moving company.